One of the neat things about Dota 2 is that you can download "Announcer Packs" that change the voice of the in-game announcer to any of a number of other characters. This one may take the cake—Supergiant games has contributed a Bastion Announcer Pack to the game. 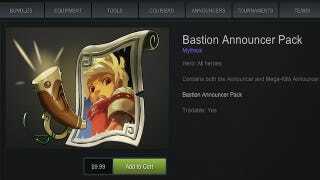 I haven't used it, but it sounds like for $9.99, you can now have your Dota 2 game announced by Bastion's narrator Rucks. Which is amazing.